January always seems like a “hands off” month when it comes to any subject other than how to be healthy. People are waking up, shaking off a month and a half food and booze induced coma, swearing off all evils for at least a few weeks. February seemed a more proper month to post this. All of those resolutions are out the window right now and people need a reason to put whipped cream on everything. Booze spiked hot cocoa really doesn’t need a recipe (add alcohol until satisfied). However, measurements might be needed for a topping. Yes, a topping. Not being much of a marshmallow lover, I always have enjoyed a rather large dollop of whipped cream on my hot cocoa. And in this scenario, I have a bottle of Amaretto that needs using up. So for the next installment of “What to do with that bottle of Amaretto“, we will spike some whipped cream with it. Mmmm…. Have you seen those new bottles of already spiked alcoholic whipped cream? Are you as freaked out as I am? Why does this exist if it takes 10 minutes to make on your own? You don’t even need to put pants on. Start whipping the cream and add in the Amaretto and sugar. Mix until medium/firm peaks form, around 5 to 7 minutes. 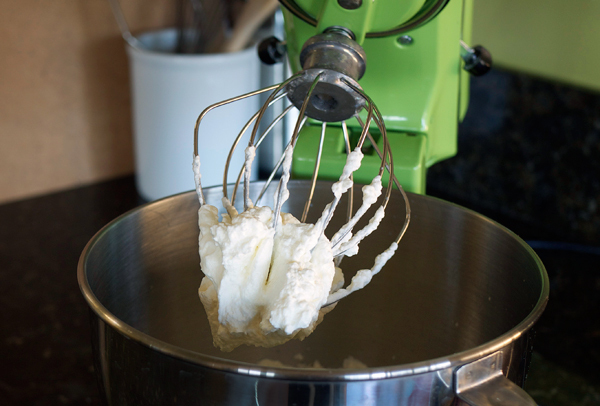 For softer whipped cream, beat it less. The colder the environment, mixer, whisk, etc. is, the faster your whipped cream will whip up. 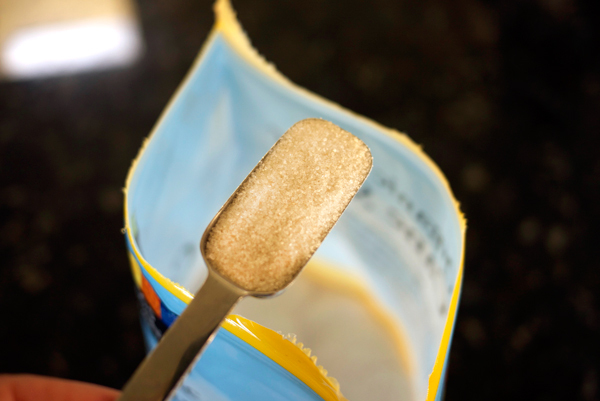 When desired consistency is achieved (and you’ve taste tested, and maybe tested a few more spoonfuls if no one is looking), use right away or store in an air-tight container. 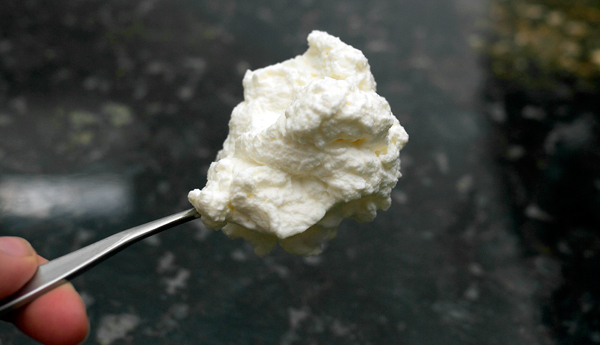 Whipped cream will last 2-3 days in the refrigerator. Concerned your whipped cream will taste too much of alcohol? 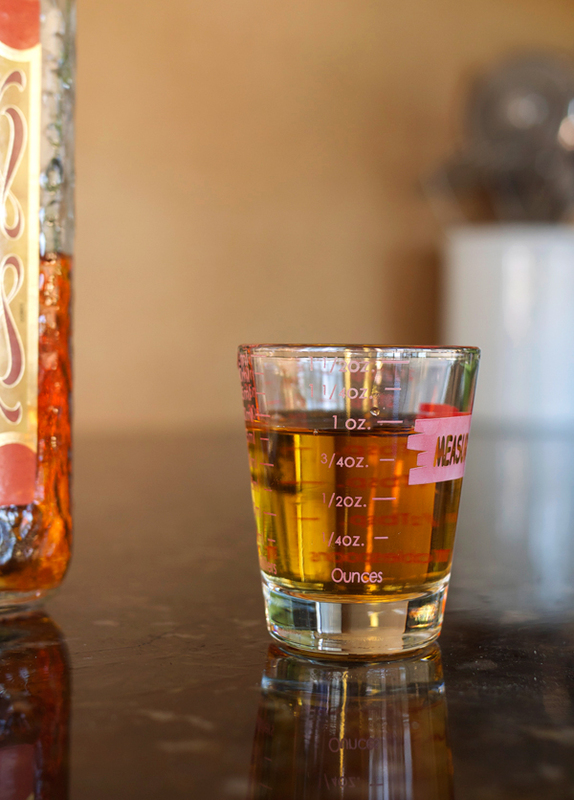 Don’t fret, even with an ounce of Amaretto, this recipe yields more like 2 to 2-1/2 cups, and mixed throughout is more subtle than you think. Also, the cream and sugar help cut through the sting of alcohol to let more of the almond flavor of the Amaretto stand out. 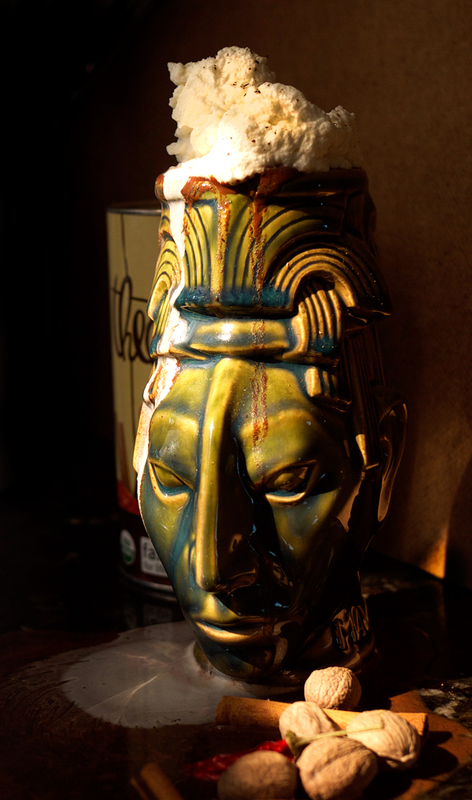 I added my whipped cream to a mug (an awesome Mayan tiki mug no less) of Mexican Hot Chocolate. The flavor of the Amaretto was a match for the earthy, spiciness of the drink. Adding a touch of nutmeg on top doesn’t hurt either. I imagine this would work just as well with Swiss Miss. great post! I dont eat stuff like this anymore (because im dead inside) but imagined it in detail. btw, what do you use for your pictures? They always have such nice clarity. Thanks! Currently I am using a Panasonic Lumix DMC-GF1 12.1MP Micro Four-Thirds Interchangeable Lens Digital Camera with LUMIX G 20mm f/1.7 Aspherical Lens (totally just had to copy all that from Amazon). It’s an OK camera for wide angle usage, but I find it a bit difficult for close range. Unfortunately the zoom lens we also have for it has such a slow shutter speed that I just can’t deal with it. I have used a Nikon D6 in the past, which I loved. But that one is dead on the inside as well. For clarity, I shoot at 100 speed usually and that means sometimes using a tripod, especially the last few months with the sun setting so early. Also, the ‘sharpen’ button in Photoshop helps a bunch. Thanks for the info! daylight is key in your shot to make them pop so much. When I take mine, its usually with an old canon with a pancake lens which is great for close range stuff but there’s only sun for like 20 minutes around these parts lately and then I feel bad for drinking @ 7am. Thanks Heather! Appreciate you stopping by! Amaretto Whipped Cream sounds divine! I don’t usually have a lot of Amaretto around but I might need to get a bottle to make this! Amaretto is tasty if you like almonds, but I imagine you could make all kinds of different flavors. Bourbon and vanilla also sound pretty good! Just found you from Joy the Baker’s site! I’ve been blogging cocktails more and more recently so am jazzed to see another LA girl into it. Consider me a new fan. Thanks for checking out the site! I feel like the LA blogging cocktail ladies are a very small group, nice to see more of them! ummmm YUM! 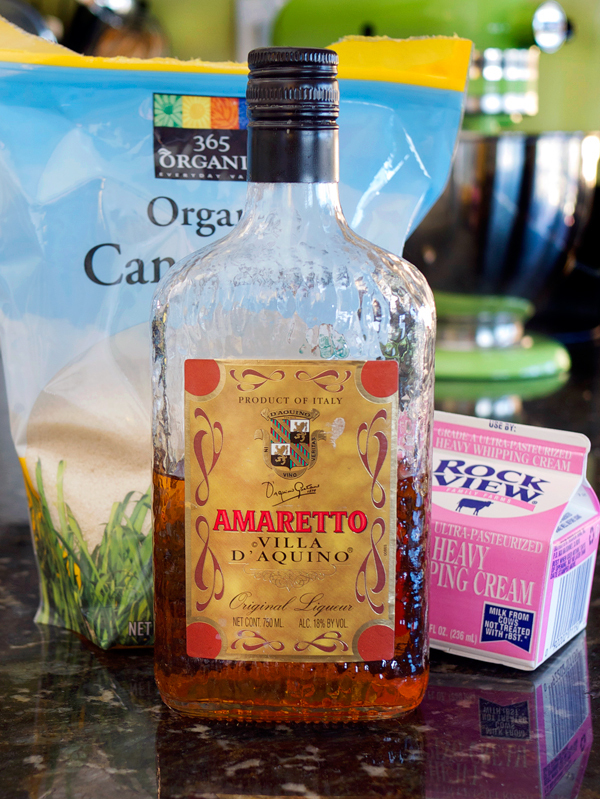 Amaretto is by far my favorite liqueur and I cannot wait to make me some whipped cream with it. And I probably won’t even put pants on. What awesome mugs you’ve got there! Just came through Joy the Baker… I love what you are doing here, I don’t need a drink with your pictures, I feel like there’s one at arms length, all the way from London. Thanks so much for dropping by the site!! I love that mug and the picture! The way the light is hitting it is perfect. Also, Amaretto whipped cream sounds awesome. I’m picturing it on chocolate pudding with some fresh raspberries… I also came through from Joy the Baker and I’m glad I did!